CarGurus has 703 nationwide 458 Italia listings starting at $144,895. One of the sleekest, most attractive supercars on the road today, the 2014 Ferrari 458 Italia continues to define the modern 2-passenger sport coupe. Garnering a long list of Best in Class and Car of the Year awards, the 458 Italia combines a curvy, aerodynamic exterior design with a road-hugging ride, well-tuned handling and powerful V8 performance, which results in a 3.4-second 0-60 time and a top speed of 202 mph. Perhaps most of all, and despite its somewhat intimidating appearance and numbers, the 458 Italia remains a fun car to drive, rarely getting away from the driver and inspiring confidence as the speedometer needle ticks forward. Now in its fifth year of production, the 458 Italia comes in sport coupe (berlinetta), convertible (Spider) and Speciale trims for 2014. All feature a midengine design, which places the V8 powerplant behind the cabin but in front of the rear axle, a configuration often used by Ferrari and Formula race cars, since it results in good overall weight distribution and balance. The engine placement, in turn, dictates the 458 Italia's exterior profile. From the side, the cabin sits forward on the chassis, providing appropriate space behind the passenger compartment for the engine. As a result, the 458 Italia displays a kinetic shape, as if it's ready pounce forward at the slightest nudge. The forward-sloping hood and low-to-the-ground nose scoops up the air and channels it back over the roofline, providing downforce to keep the front end firmly planted at higher speeds, while the long rear haunch and fastback-style rear window add to the vehicle's sporty, aggressive good looks. Up front, two large air intakes flanking the low, wide grille channel air into the radiators and engine compartment, as well as along the car's flat underbody. The grille includes two horizontal winglets, which help provide downforce and reduce drag at higher speeds. Unique long narrow headlight bays framing the hood include HID lights, which swivel as the car turns to illuminate the road ahead, as well as a half-dozen rows of 20 LED lights, which double as turn signals and daytime running lights. At the rear, small round taillights and triple exhaust pipes centrally located add to the 458 Italia's distinctive appeal. Large wheel wells housing staggered-width 20-inch wheels complete the look. The Speciale gets a performance-oriented composite bumper, as well as unique wheels, tires and racing stripes, while the convertible receives a retractable hardtop, which stows into a rear compartment in under 10 seconds. While the exterior design certainly makes a statement, the heart of the 458 Italia remains its V8 powerplant. Rather than hidden away under sheet metal or aluminum, the V8 can be viewed through the rear fastback window, providing a visual cue to its design and placement. Featuring a new design with some innovative machine work, the V8 delivers 562 hp all the way up to 9,000 rpm and 398 lb-ft of torque at both high and medium revs. The engine links to a 7-speed Getrag electro-hydraulic dual-clutch transmission, mounted longitudinally at the rear axle. The dual-clutch design reduces gear shifts to just 4/10ths of a second, which ensures optimal torque delivery during acceleration and high-speed maneuvers. Fuel economy tops out around 18 mpg. Ferrari also paid attention to the engine's sound and harmonics, which are unhampered at lower revs but moderated with silencers at higher speeds to ensure a deep sound and audio comfort for the passengers. Inside the cabin, Ferrari places the driver squarely at the center of the action. Main controls like engine start, headlights, gear-shift paddles, windshield-wiper controls and chassis/suspension adjustments, are located right on the steering wheel, while two pods on either side of the instrument cluster contain secondary features. In addition, Ferrari has eliminated any column-mounted stalks, so the driver never has to take his hands off the steering wheel to manage the primary controls or make adjustments to the vehicle's ride and handling. Other buttons for features like Launch Control, which provides the best possible acceleration, are located on the center console. The dash, steering wheel and center console all feature aluminum surfaces with hand-stitched leather trim. The driver and passenger should find plenty of legroom and headroom in the cabin. Highly contoured and heavily bolstered sport seats come wrapped in hand-upholstered leather with matching stitching. The standard seats feature a magnesium backrest structure, although owners can opt for lighter carbon fiber seats in 3 sizes. Leather with Alcantara trim is also available. Alcantara-trimed sport seats with carbon-fiber backrests, as well as carbon-fiber interior trim, come standard in the Speciale. A small rear cargo space provides 8.1 cubic feet of storage space. Underneath the floor, Ferrari equips the 458 Italia with a double-wishbone front suspension, multilink rear suspension and an E-Diff3 electronic active differential. The E-Diff3 in particular works closely in conjunction with the vehicle's F1-Trac traction control system to ensure optimal distribution of torque to the rear wheels. The F1-Trac system includes Sport, Race and Low Grip settings, and it can be deactivated as well. The sport-tuned suspension was designed to absorb bumps and minimize body roll, and includes the automaker's Magnetorheological Suspension Control (SCM) system, which adjusts dampers instantly to ensure a smooth, capable ride, which receives high marks from reviewers. Carbon-ceramic Brembo brakes come standard, along with direct-ratio steering. Safety systems include Vehicle Dynamic Assistance and antilock brakes. It all adds up to a package that epitomizes the modern street racer. Many of the 458 Italia's components, designs and systems draw on earlier vehicles, while others were redesigned from the ground up specifically for this car. Sure, it has a price tag in the stratosphere, but if you're looking for the truly ultimate driving machine, it's hard to find anything else on the planet that can quite match it. What's your take on the 2014 Ferrari 458 Italia? 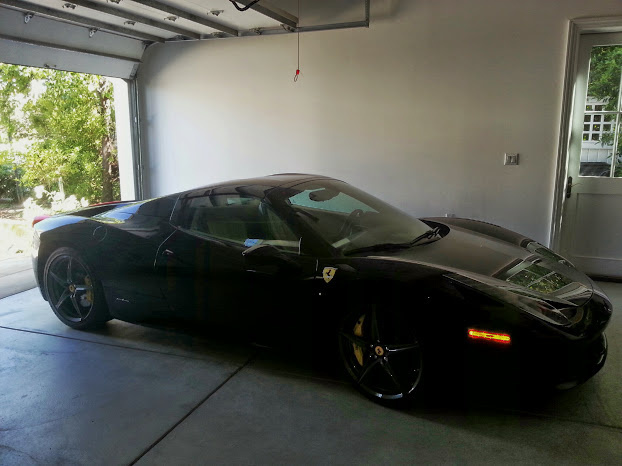 Have you driven a 2014 Ferrari 458 Italia? I have my car sold on your website and need some help or how to complete paperwork. If the buyer makes an offer And I accept. Will the paperwork get started for the sales transaction.